Let it not be said that The Sky Surfer is afraid to employ a time-worn (some would say “hackneyed”) simile to title a piece. Regardless, as you will see later in this latest photo-journalistic exercise, I think you will agree the “Free Lunch” metaphor is the perfect fit. Sometimes, (the recent “Hit and a Miss” story, for instance) I am concerned I am being exceptionally verbose in my Sky Surfing posts. As one who’s musical tastes reflect the aphorism “words can get in the way of a good song”, perhaps too many words get in the way of a good photo piece, too. This story is going to follow that stricture and let the photos and captions carry it most of the way. That being said, I do need to put some words down to set a path for The Fun Flight you are about to go on. Bein’s how Fun Flying and Flight Blog Writing don’t make me any money, I am still in the workforce. The week leading up to this “Free Lunch” flight/story was very busy. I did not have a chance to plan a flight to a “never before seen” venue. 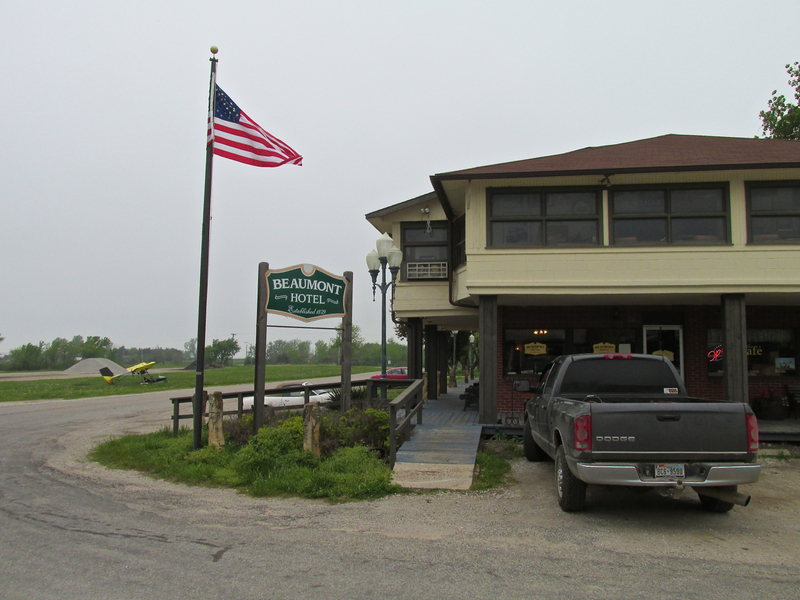 Regardless, I still was eager to fly that Saturday (18 May), so I fell back on the always excellent flight (and bike) destination: The Beaumont Hotel in Beaumont, Kansas. The food is good. The service is good. 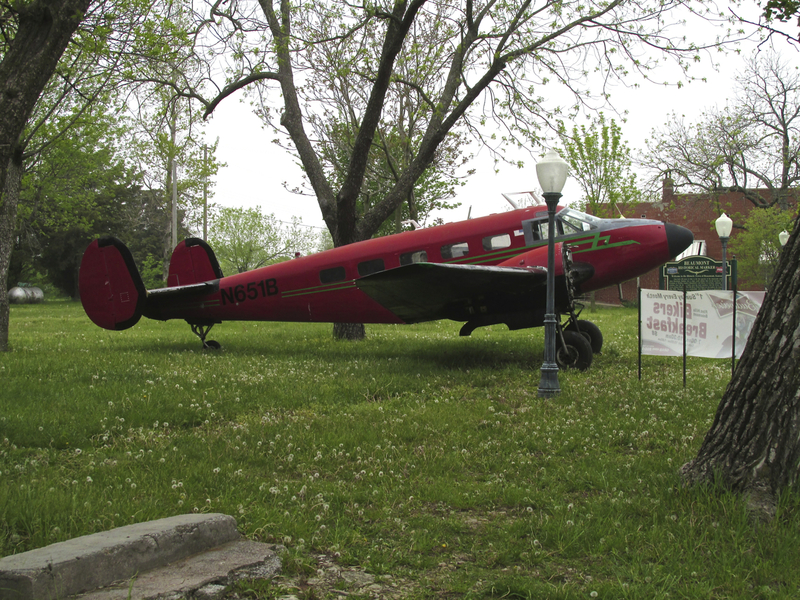 Also, you can taxi your plane up to the front door of the restaurant. What can be better than that? Beaumont it would be. On arrival to Selby Aerodrome, the appearance of the sky put some doubt in my mind as to the possibility of a flight to Beaumont. This Spring has been a welcome respite from the drought our region has endured for the past three to four years. In fact, the night before I am writing this, a tornado went through the Wichita area and deluged us with water. There was no loss of life and no major damage but the water fall was great. This made the “No Free Lunch” Saturday an extremely humid morning. 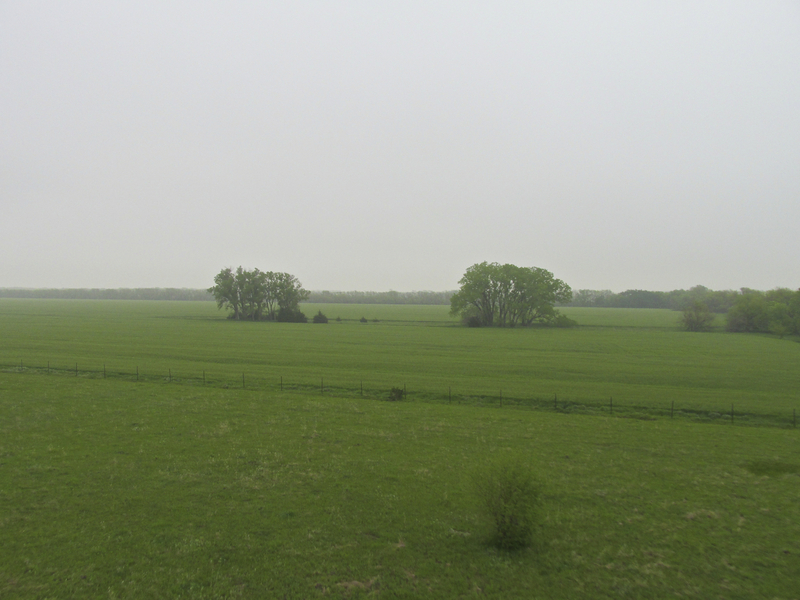 Instead of the standing ground fog as I showed you in the “Hit and Miss” story – today the humidity was all in the air. The sky was completely overcast and visibility was limited. This was taken immediately after takeoff. Visibility was only a mile and a half. 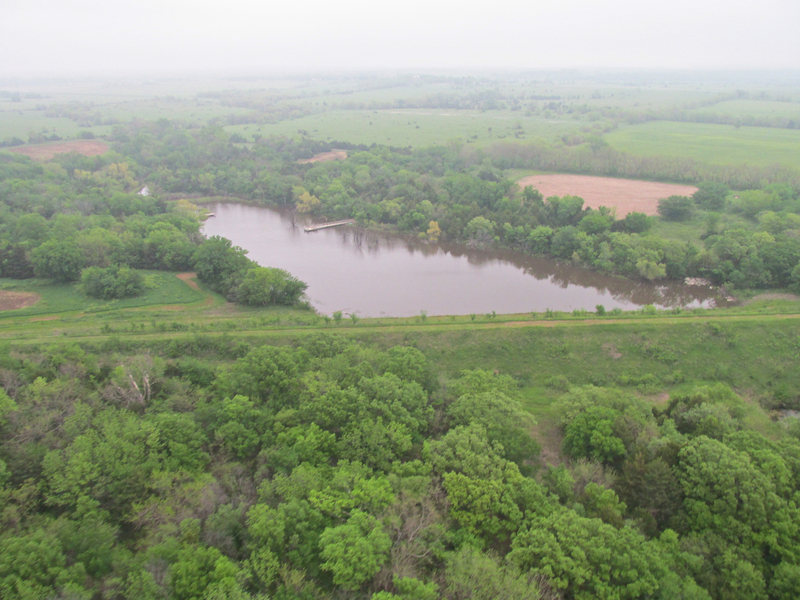 Turning to the East with the Ninnescah River and the pass between Derby and Mulvane ahead, visibility even seemed to be decreasing. Seen from the ground, the atmosphere was solid overcast. 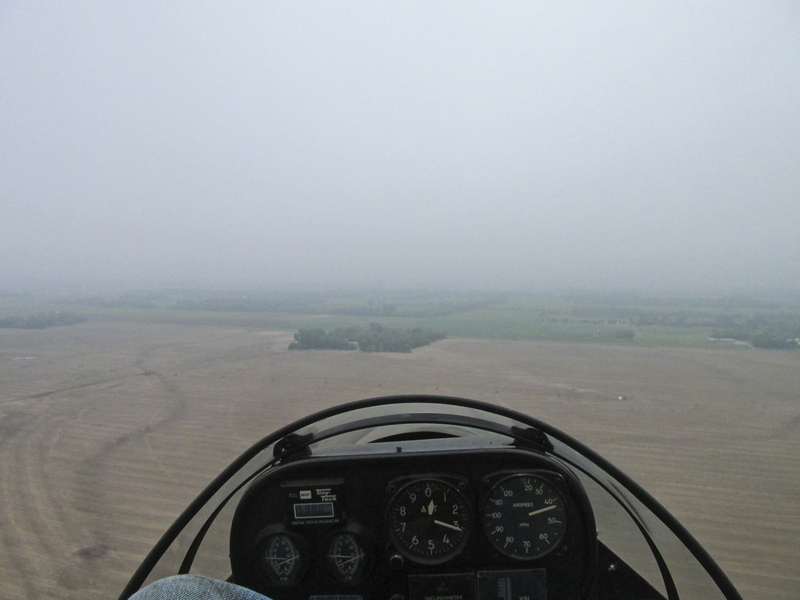 After takeoff, though, I was surprised how poor the horizontal visibility was. Obviously if you can’t see, you can’t fly. 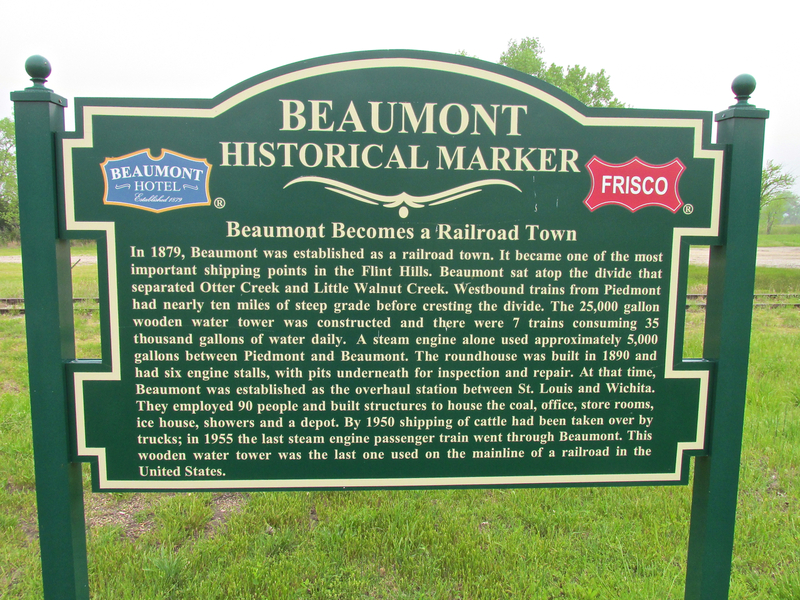 I decided I would ease in the direction of Beaumont (East) and be prepared to turn around if I felt a raindrop or if the visibility decreased any more than a mile. What you are seeing in these photos is extreme humidity. The weather report said it topped out at 96%. There were no rain cells evident. Keep in mind I am only moving about 30 miles per hour across the ground. 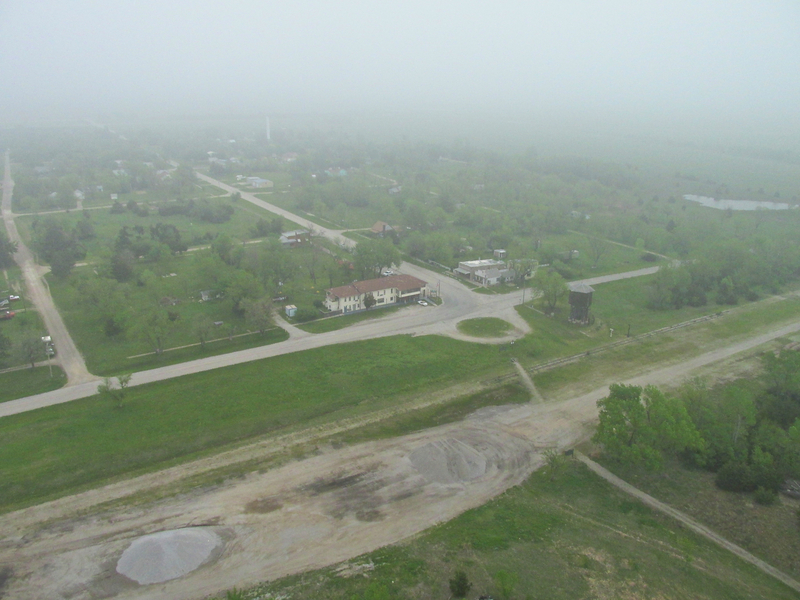 Heading East, crossing South of Derby, Kansas the visibility was still about 1.5 miles. 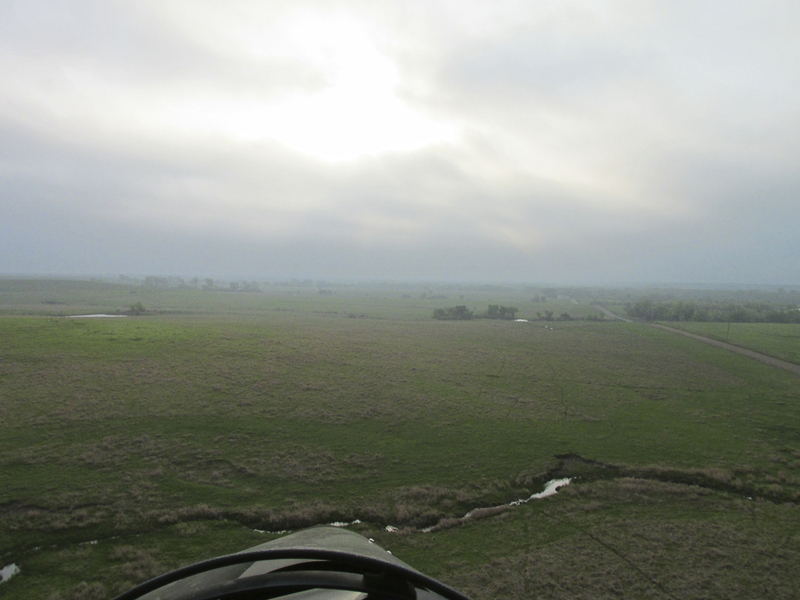 This is looking North under my left wing from about 600 feet AGL. 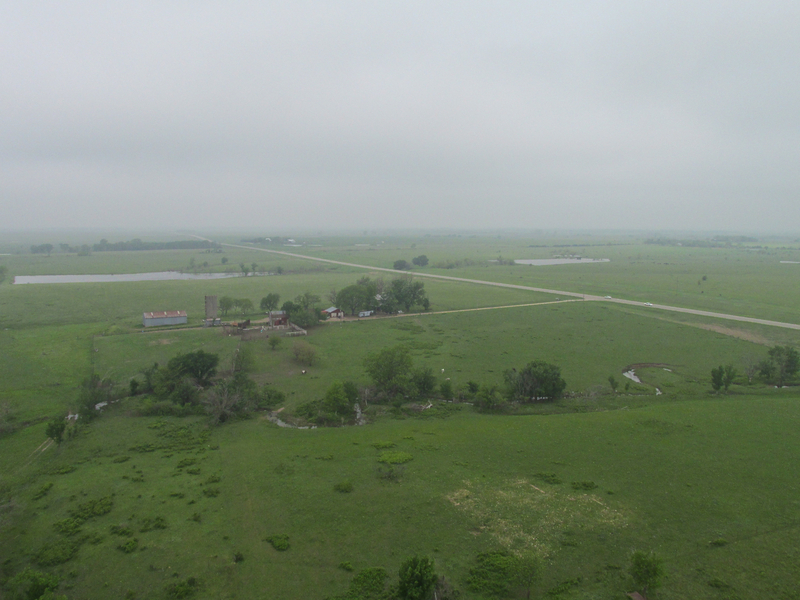 This was taken South of Rose Hill, Kansas looking East from about 500′ AGL. The visibility had increased to between 2 and 3 miles. The atmosphere was very uniform in consistency and was being gently carried along by a Southeast wind of 8 mph. I figured it would blow through the area in the next hour or just remain as you see in the photo. Either way, I decided I would continue unless the visibility dropped dramatically or it started raining on me. If either were to happen I would turn back to Selby or land. 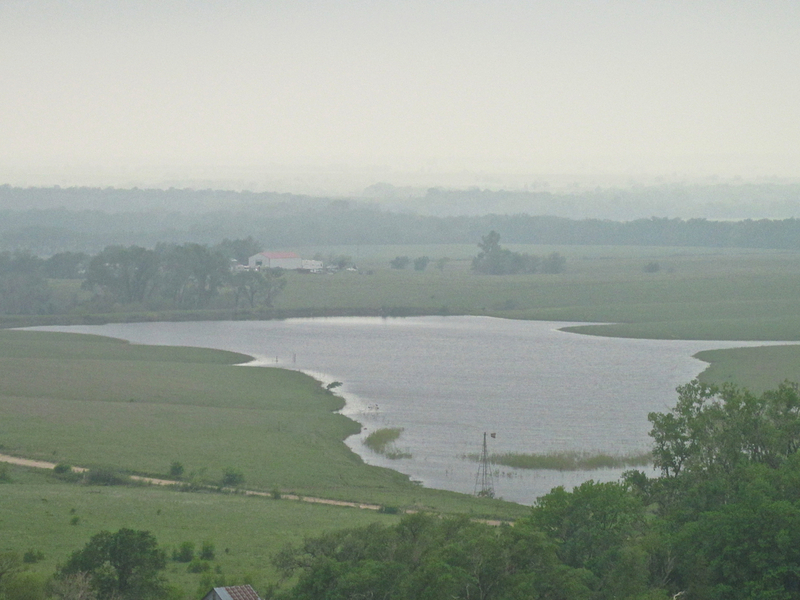 At the beginning of The Flint Hills, I saw this nicely maintained lake. 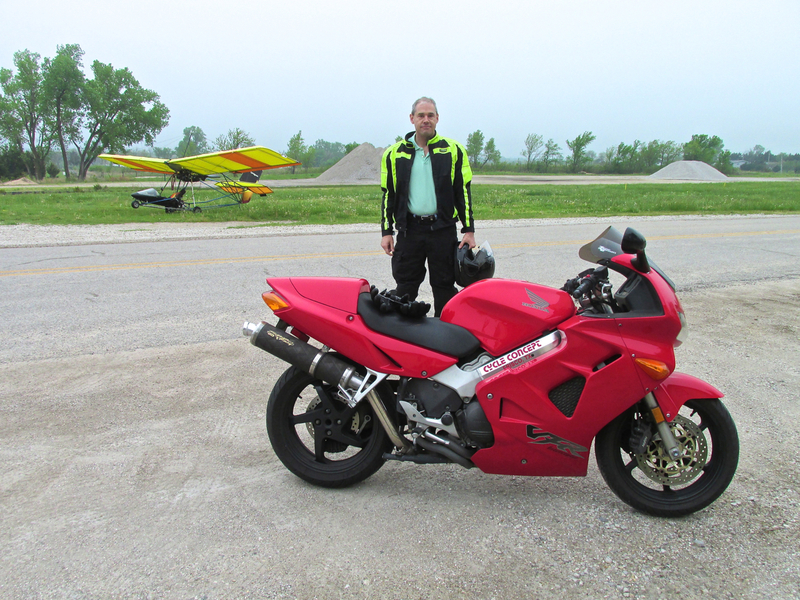 The quartering headwind was still only about 8 mph so I was able to cruise a little higher above ground level and maintain a 30+mph ground speed. The wind was picking up so after crossing the creek shown here I dropped down lower. 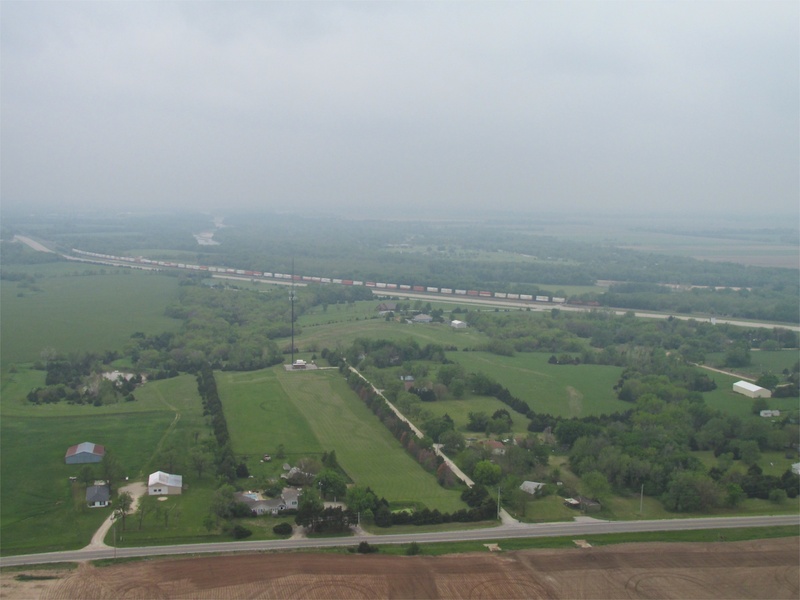 This was shot from about 175′ AGL looking due East. 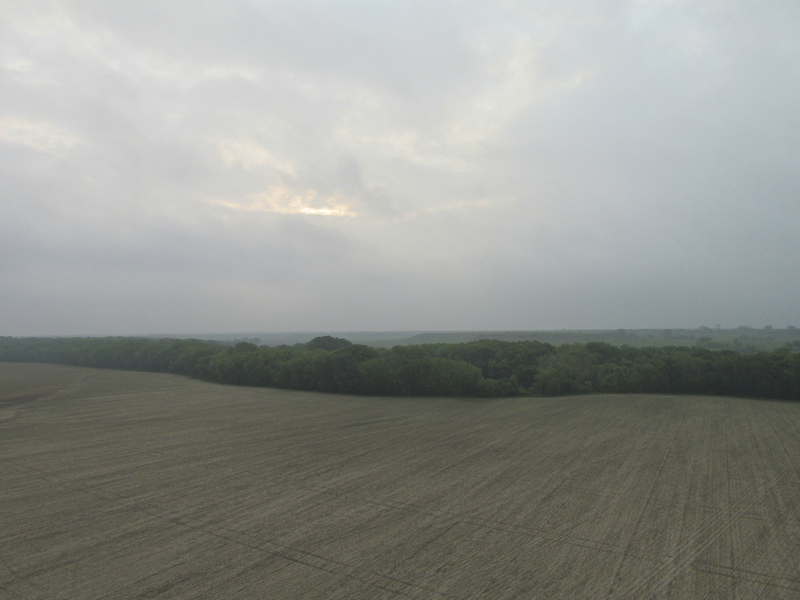 For about a 30 seconds the sun cut through the overcast intermittently like a strobe. I didn’t quite capture it. 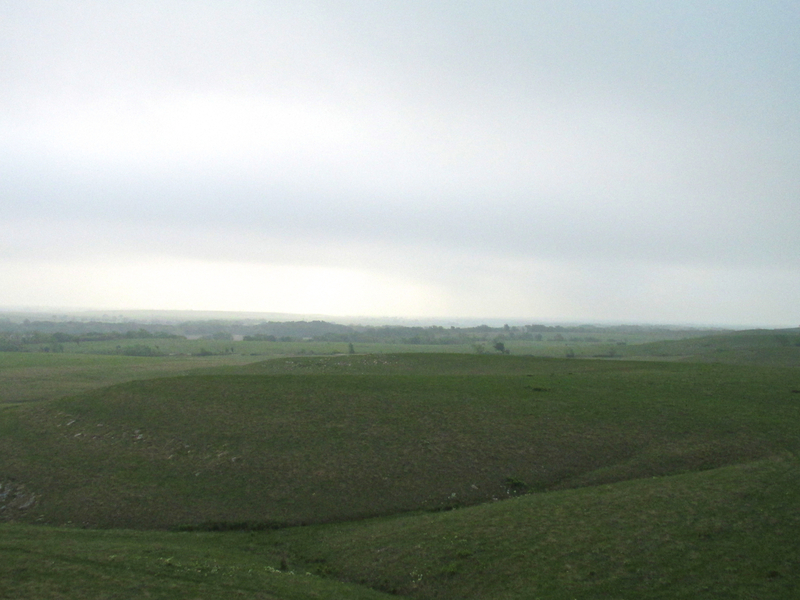 I am now in The Flint Hills. Shortly after the last shot I saw this majestic bluff ahead. 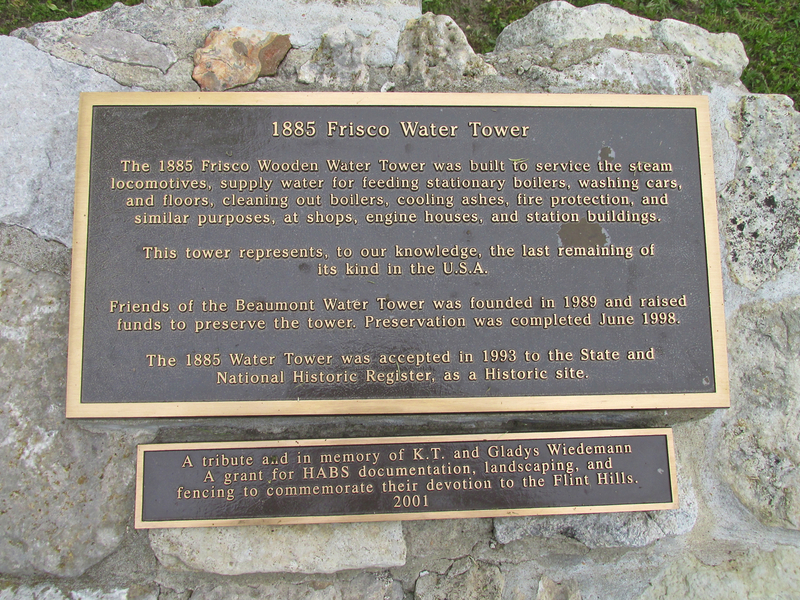 At the top of the bluff, in perfect location, is this hunting tower. 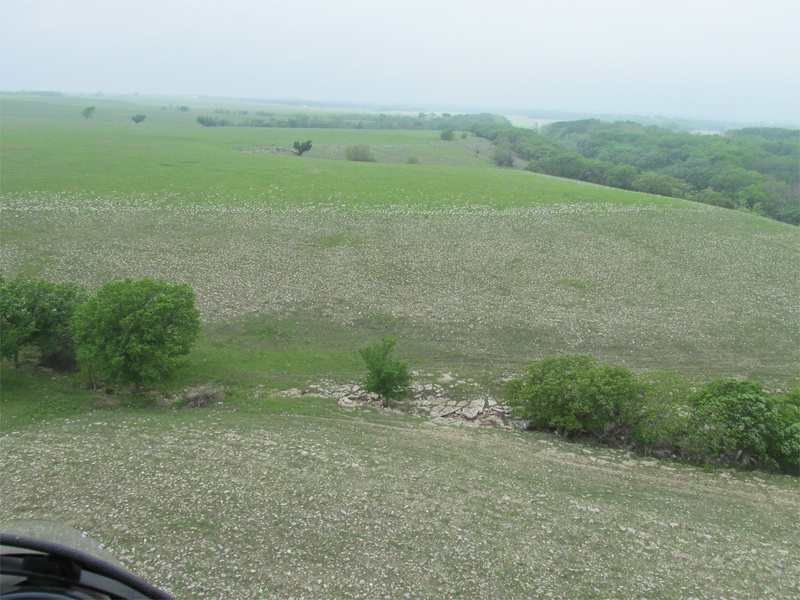 This is one of the best deer hunting spots I have yet seen. 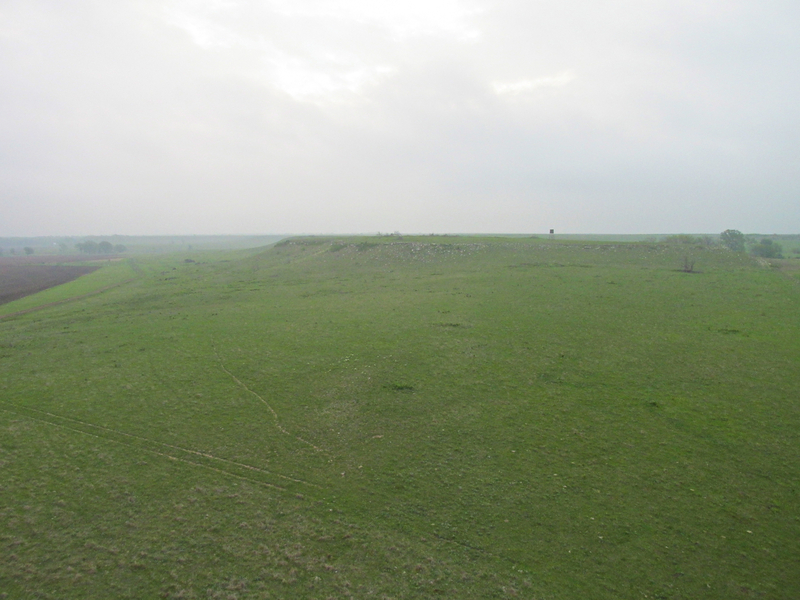 The wind had picking up so I descended to about 35′ AGL. Now down in my “nap of the earth” mode, this beautiful meadow came into view. I took the picture before easing between the two stands of trees. We are looking due East. 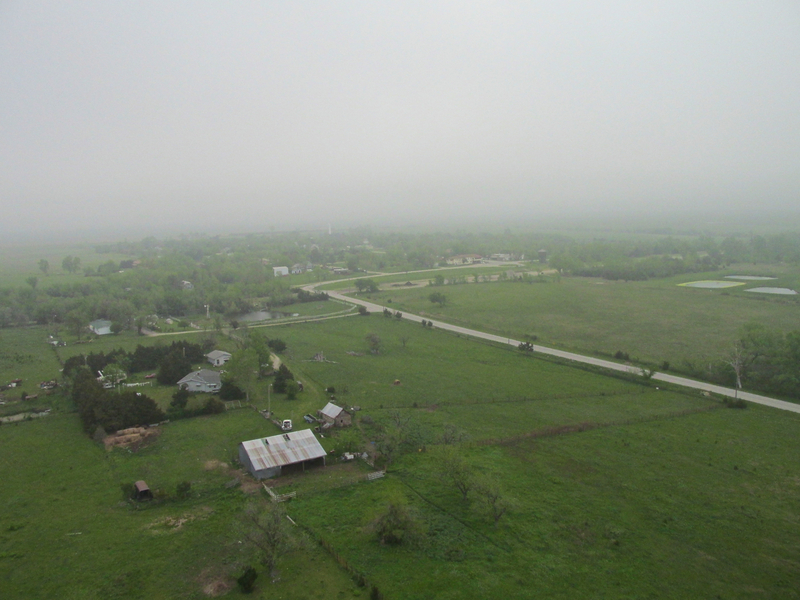 Looking at the next four photos I realized I have not not done enough to make the case for this “overcast, low viz flight”. I have flown to Beaumont across this enchanted countryside many times but never was it like this. The “hanging humidity” and the “flat” lighting enhanced it like never before. It was dreamlike. 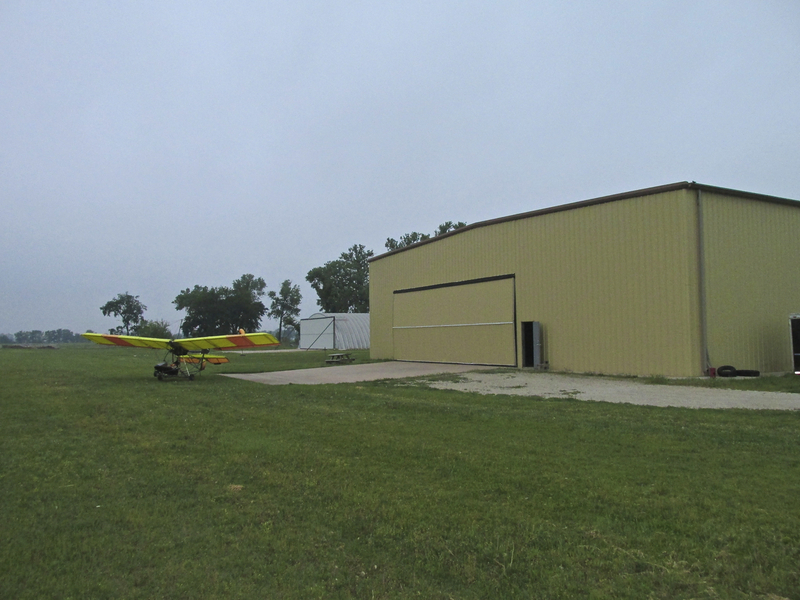 I have flown Ultralights in Kansas for almost 30 years and never saw anything like this before. I hope I will get another chance some day. By the way, my friend Glenn Hopper, who works at Spirit Aero, says he likes it when I include a little of the cockpit in the panoramic photos. 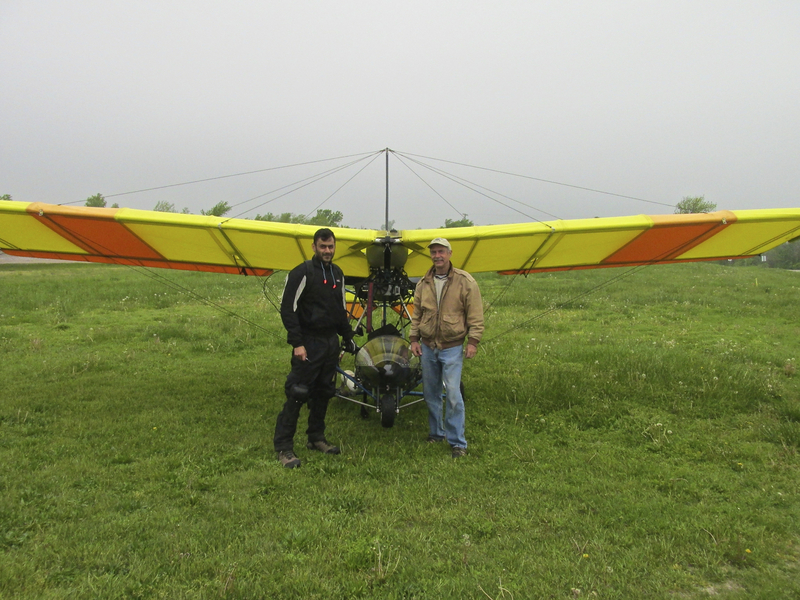 He says it helps put the viewer in the seat of the Ultralight. I thought of you while clicking the shutter on this one, Glenn. Back in the 1970’s, much was made of the “Geoglyphs” on the Plains of Nazca in Peru. One best selling writer of the time decided these various depictions could only be seen from outer space and insisted this was proof the Earth had been settled by spacemen. I don’t buy that and evidence has not borne his theory out. The Nazca signs, just as the one below, can be seen from higher topography in the area. Nonetheless, they are seen best from the air. This is the second time of my many flights to Beaumont I have come across this symbol. Last time I spent a little time checking the internet but did not find a brand that matches it. It looks like it might be the “Kay-Bar” brand. One thing this sign does tell me is that I am within minutes of sighting the Beaumont Hotel and Airfield. 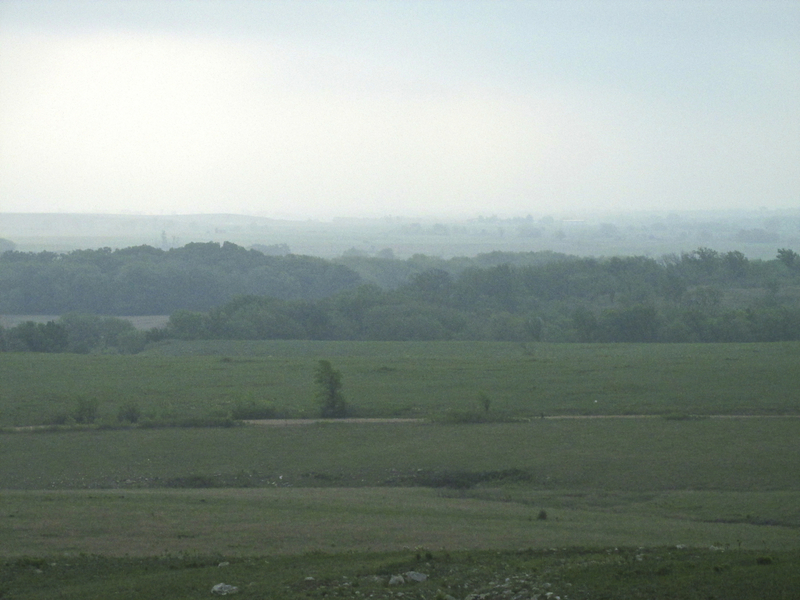 On a Clear Day, the Wind Generator Field would be seen on the horizon at the top right of this shot. There are 100 windmills in this group. Today they are completely hidden. I never saw them the whole day. It is always a fine and wonderful thing when one’s flight destination shows up precisely where one expects it. 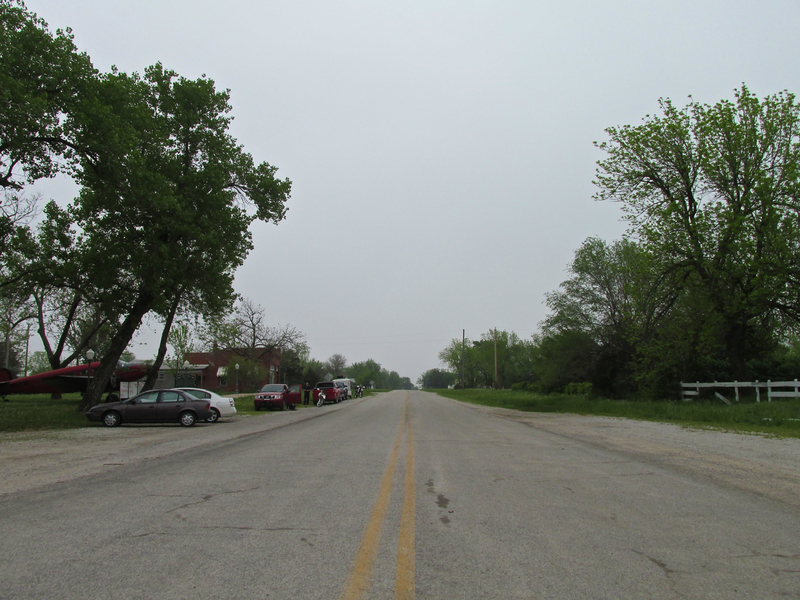 In keeping with that, the hamlet of Beaumont, Kansas suddenly appeared from out of the mists directly in front of me. 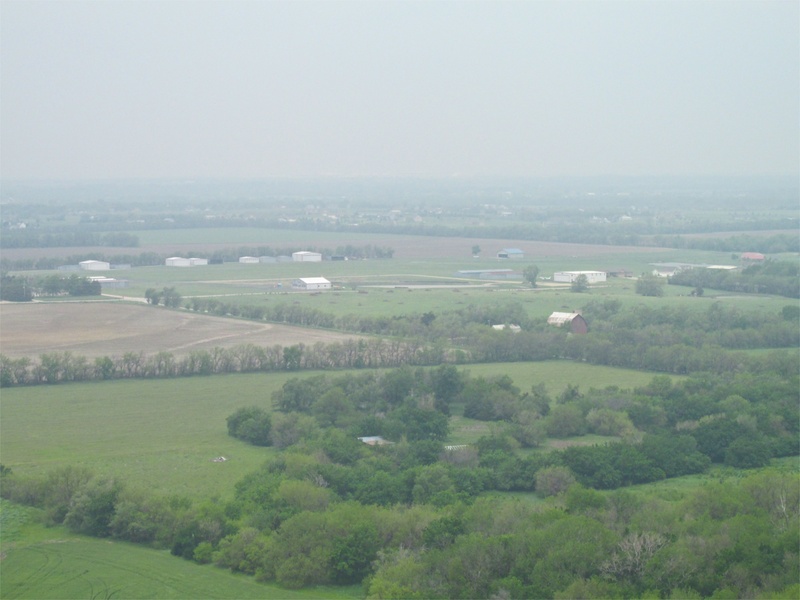 The airfield is at the far right (East side) of town. I took one more picture so you could see the Beaumont Hotel and Restaurant more close up. Also take note of the structure to the right of it next to the large tree. Seen from the seat of my MXL while taxiing in from the runway. This is facing West. The Quicksilver at rest after exactly One Hour and Thirty Minutes in the air. The only thing lacking at Beaumont is aircraft tie downs. I wish they would put some in. (Hint for management: A few 5 gallon buckets filled with concrete with a curved piece of rebar in them work great. They are cheap and can be positioned anywhere needed.) 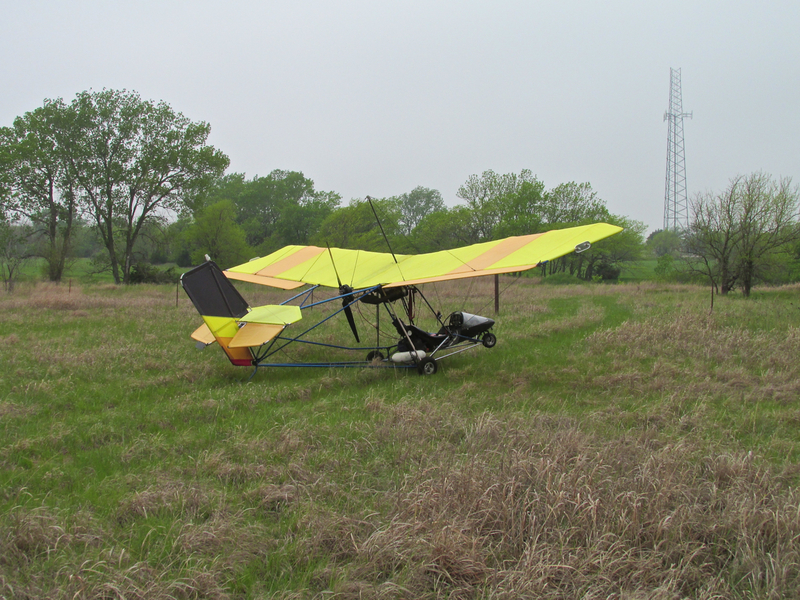 The wind was gentle on the surface, though, so I didn’t worry about leaving the MXL sitting there on the grass as I went in for breakfast. 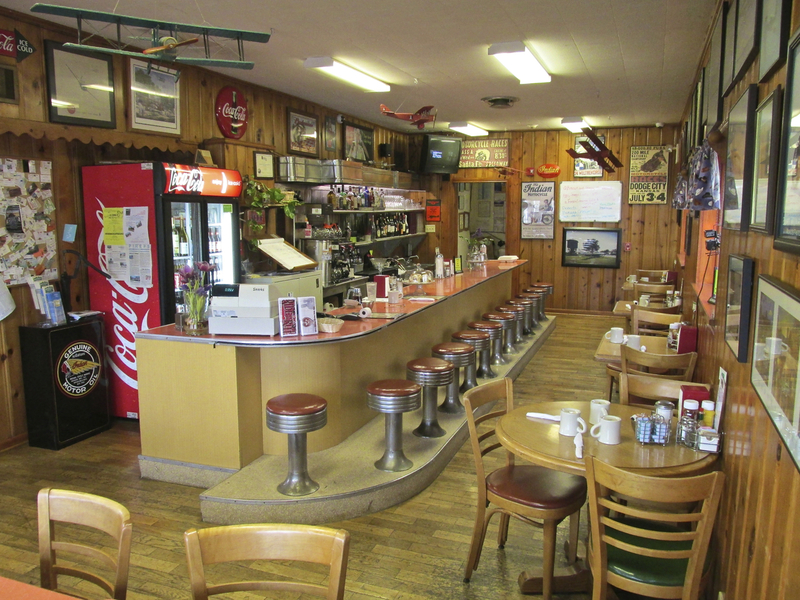 When I entered the front door of the Beaumont Cafe I was the only one there. The faster aircraft could not fly in the low visibility and the usual group of touring motorcyclists had not yet arrived for breakfast. That would soon change. There is also a large dining room but the diner side of the Beaumont Hotel is a classic of the American Diner tradition. This one features autographed photos from pretty much All the Aviators of Note on the walls. There’s No Free Lunch, But A Free Breakfast Is Every Bit As Good! 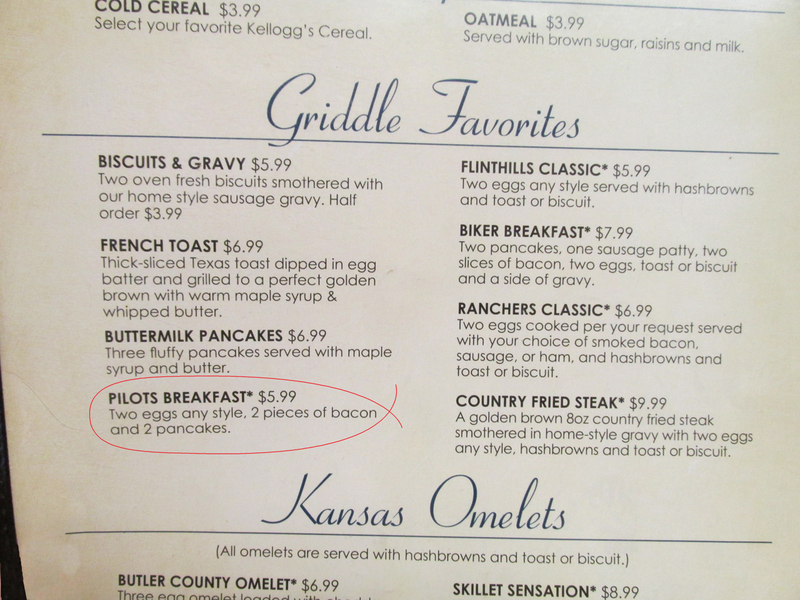 A great morning suddenly got better when Waitress Kim Neves (formerly of California) told me the new promotion is that pilots who fly in get a Free Breakfast! After eating I decided to stroll around a bit and transmutate light into digital memory pixel patterns. The following shots were all taken within 50 yards of The Hotel. 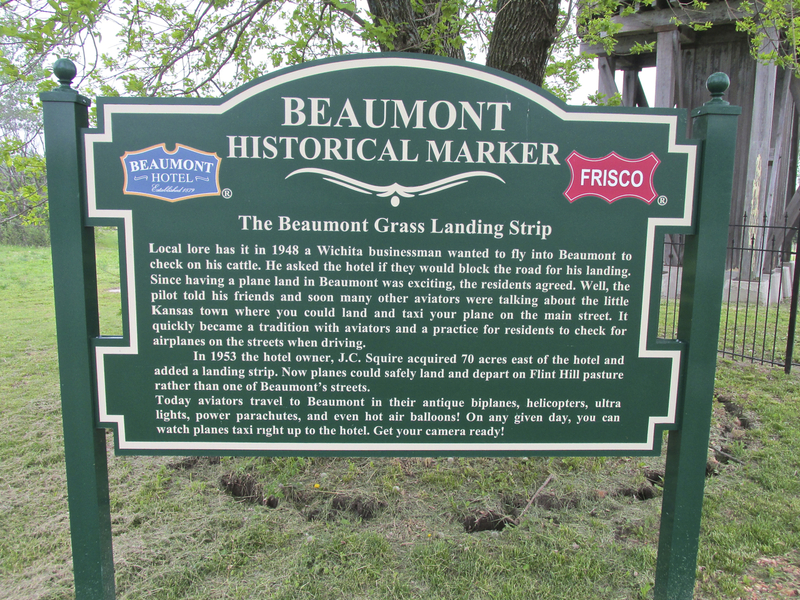 I think everyone should make the trek to Beaumont no less than once a year, preferably more. Whether you fly a plane or drive a car or motorcycle, it is a special place on the plains. People were starting to arrive. This truck caught my attention because it had Texas plates. 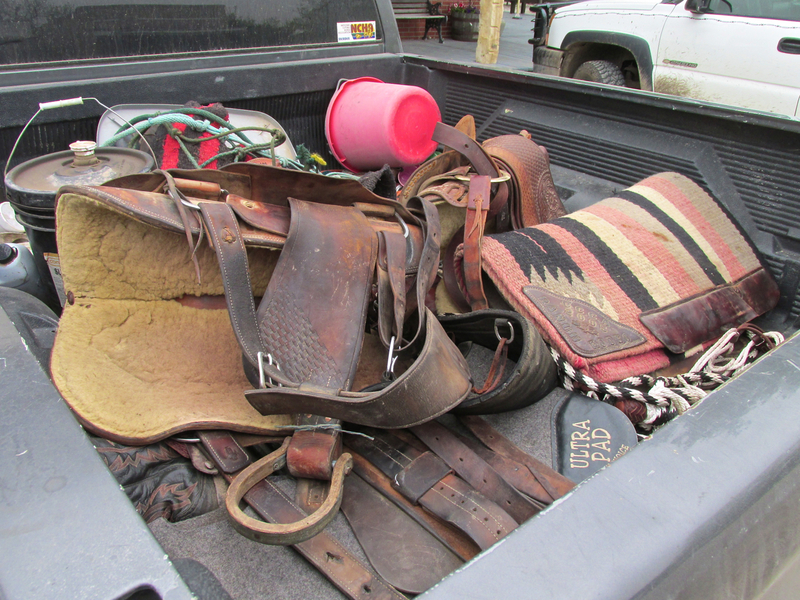 Walking by the Texas Pickup I noticed they were carrying a saddle and other ranch-type gear in the bed. Just what I hoped to see out here on The Great Plains. 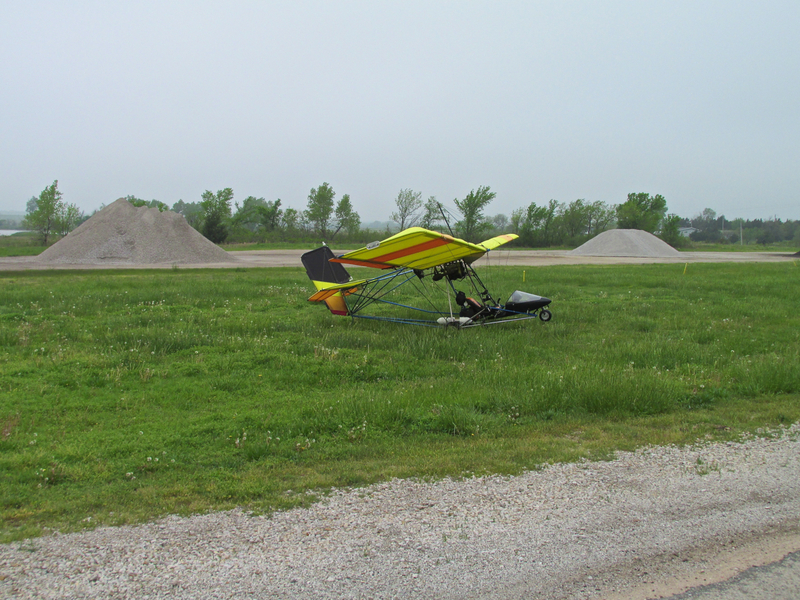 The airstrip is about 175 yards from The Hotel. I didn’t think you needed to see it because this tells you what you need to know. If you review my aerial photo as I approached The Hotel earlier in the report you will see this special wooden water tower adjacent to it. This section of track has been left in place to retain the look and feel of the old railroad stop. It was time to return to Wichita. I had made my pre-flight check of the plane, had my earplugs in/goggles on when Brian Wend pulled up on his rocket ship. He was motioning to me that he would like a picture of my plane so I stopped to accomodate. Far be it that I would be in such a hurry on a Fun Flight that I wouldn’t stop to chat about Airplanes, Cars, Guns or Motorcycles. I found out Brian is an engineer at Learjet. He recently moved to Wichita from Fort Worth, Texas. He had heard about the cool drive to Beaumont and this was his first trip. Then in short order another bro on a Saturday Morning Adventure showed up. 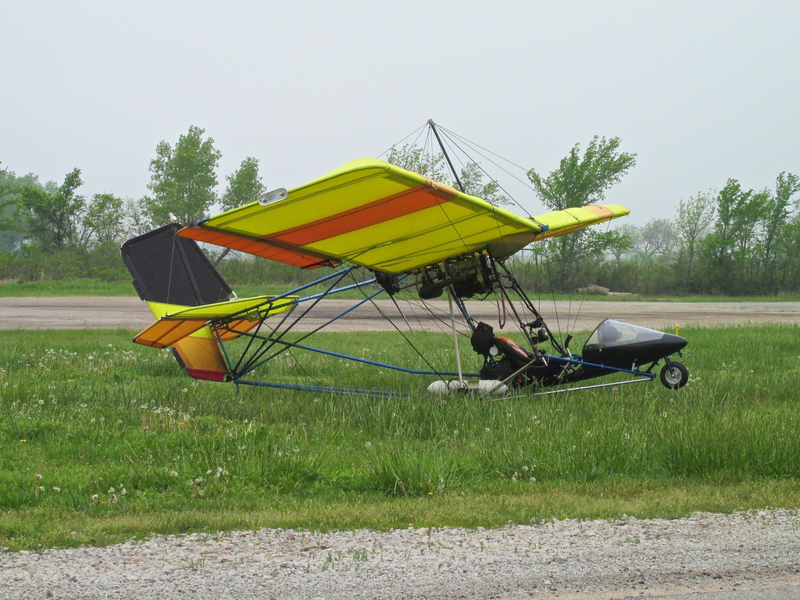 He was very excited to see my plane because his brother flies Ultralights, too. This is Abe Khalid Ebrahim and he is an accountant at Via Christi in Wichita. He wanted a shot of us with my Quicksilver to send to his Brother. Brian Wend cycled through all the cameras to get all the requisite shots for all of us. Brian and Abe were ready for breakfast and I was ready to take to the air. I told them to hang around for a minute and I would fly overhead for them if they wanted a shot of that. I flew over and waved goodbye as I set course due West for Selby Aerodrome. 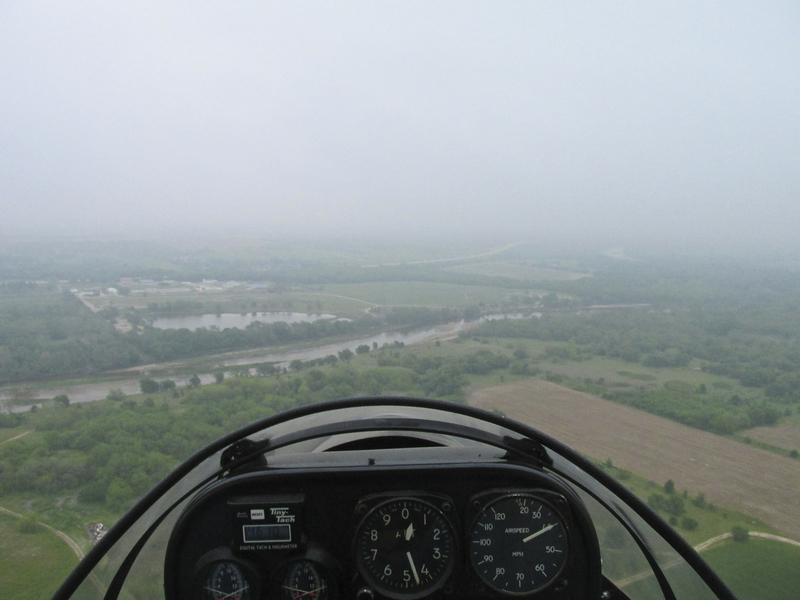 I wasn’t in the air much time at all when it felt like I was being pelted by BB’s – RAIN! Now I don’t mind flying in the cold, rough air to a certain degree, heat over 100 degrees, but rain is a deal stopper. Besides being uncomfortable to the face, neck and hands, I have heard it is not good for my PowerFin composite propeller. 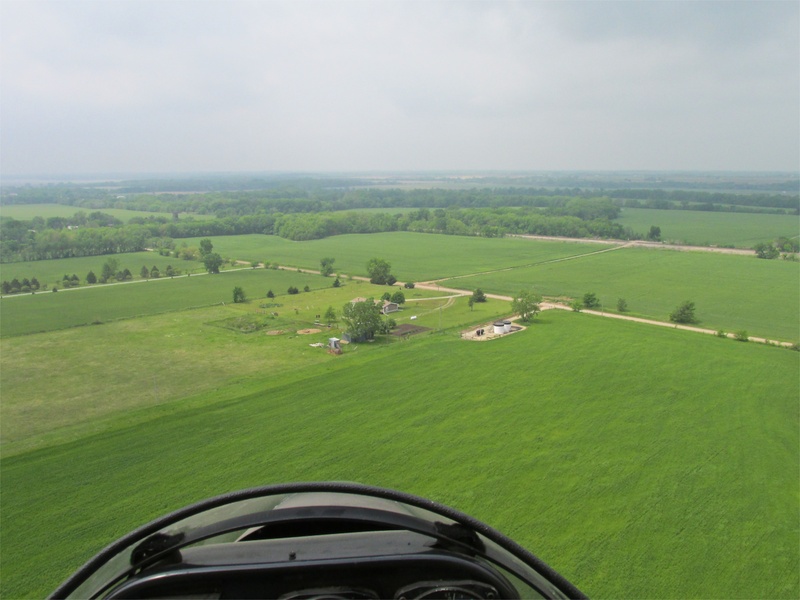 Always prepared to land, I had seen a potential landing field just ahead. 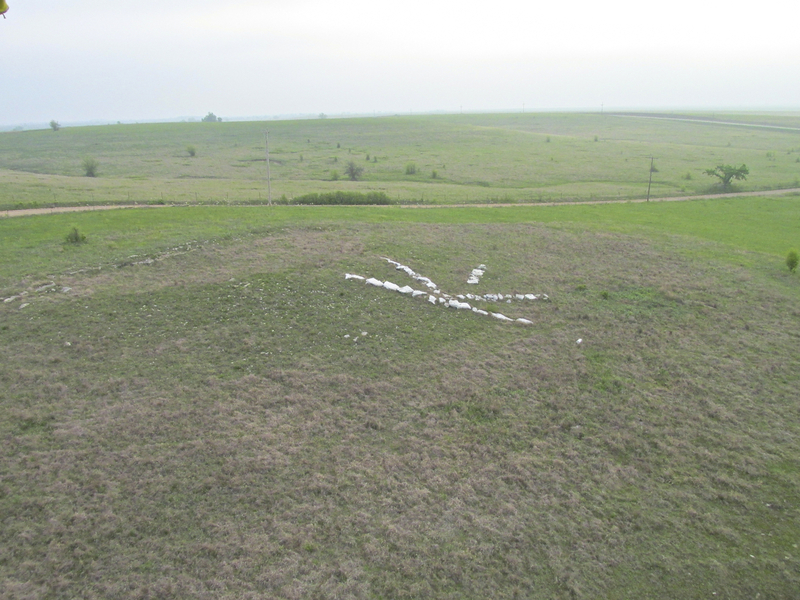 It was a perfect “fallow”-type field with ingrained pickup truck tracks on it. The perfect landing strip for my MXL. 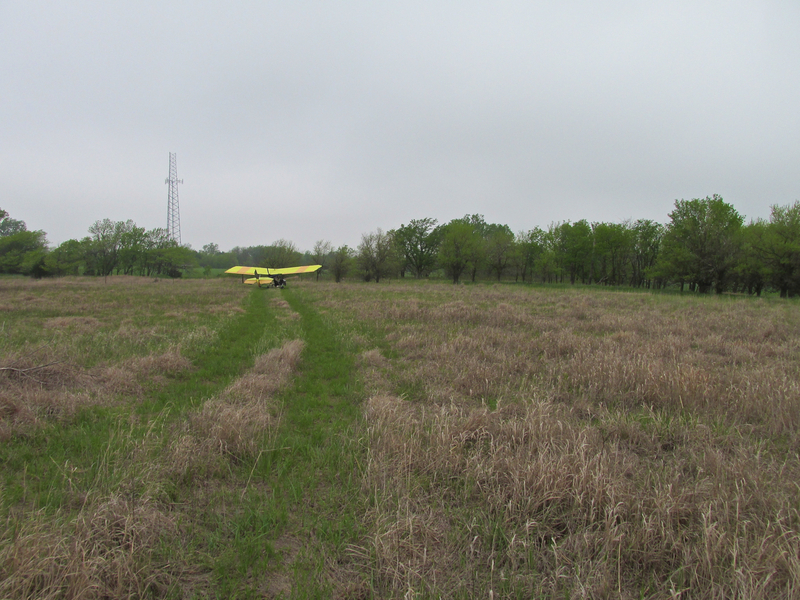 This landing field came equipped with its own cell tower. I made a few calls while waiting out the weather. 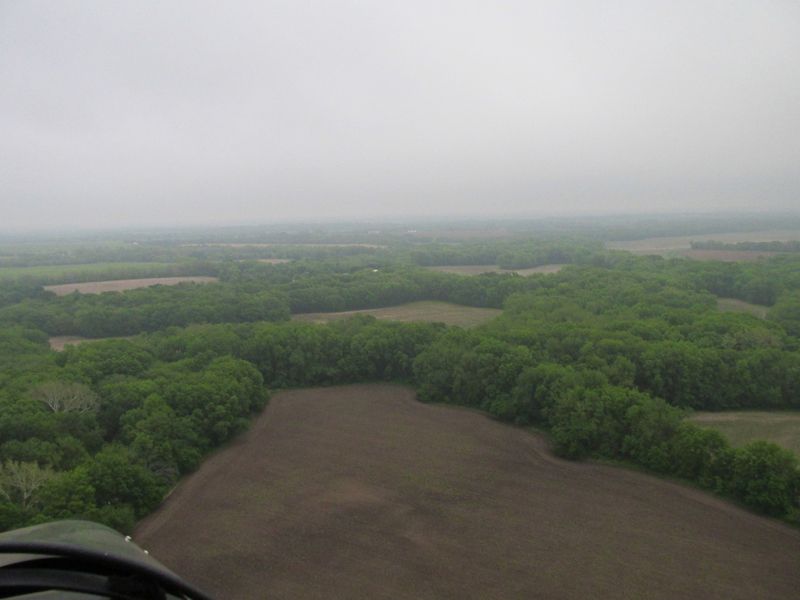 I taxied as close as I could to the tree line. This seemed to give some cover from the wind. Even so, the wind was only about 12 mph for a short time and was not gusting. No big thing. After landing I was prepared to wait out the shower standing under a wing but didn’t have to. The rain that had hit me in flight disappeared as soon as I touched down. This indicated to me that it was a small cell or front to the West of my position. I decided to take a break and watch the sky until I had enough evidence it had passed by. After an hour, the sky brightened up and the wind speed dropped. Those were the signs I needed. I took to the air again. 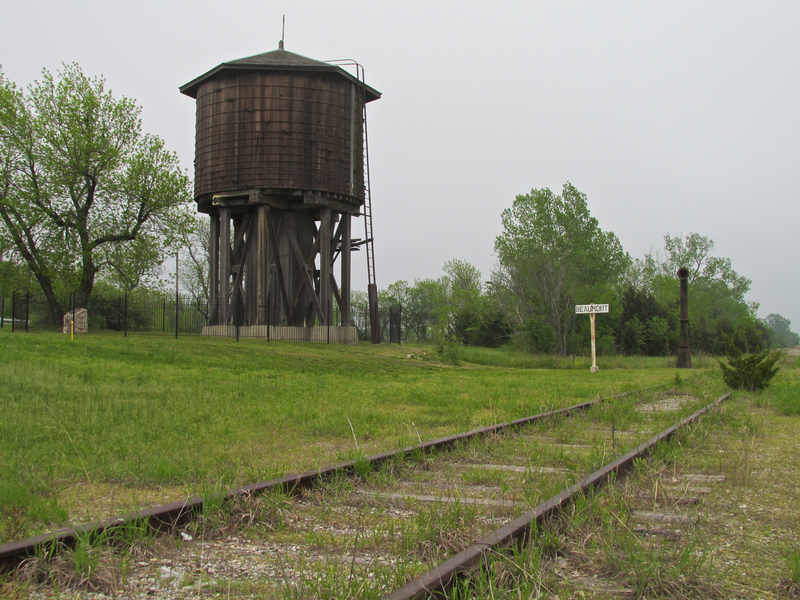 Earlier I showed the remnant of the railroad track next to the Famous Wooden Water Tower at Beaumont. 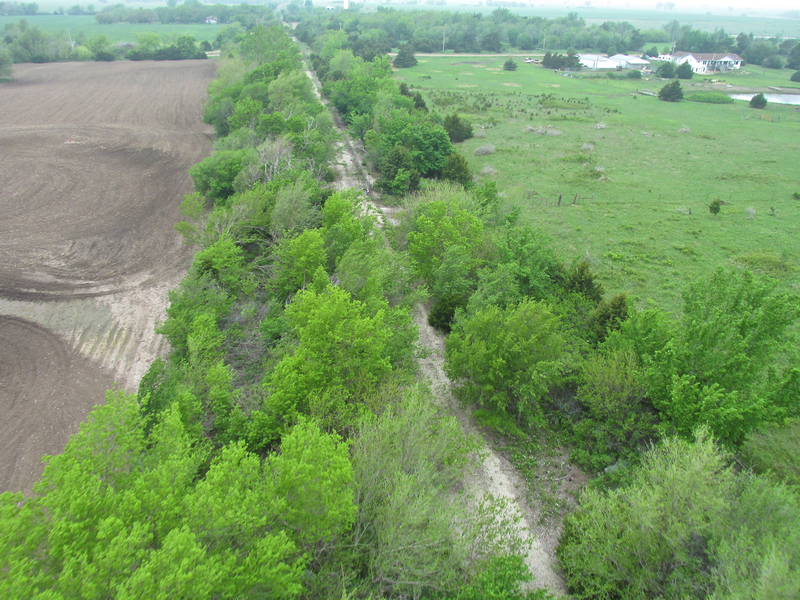 This is the same track bed heading West out of Beaumont, steel ribbons long since removed. Humidity remained very high but I experienced no rain drops for the rest of the journey. 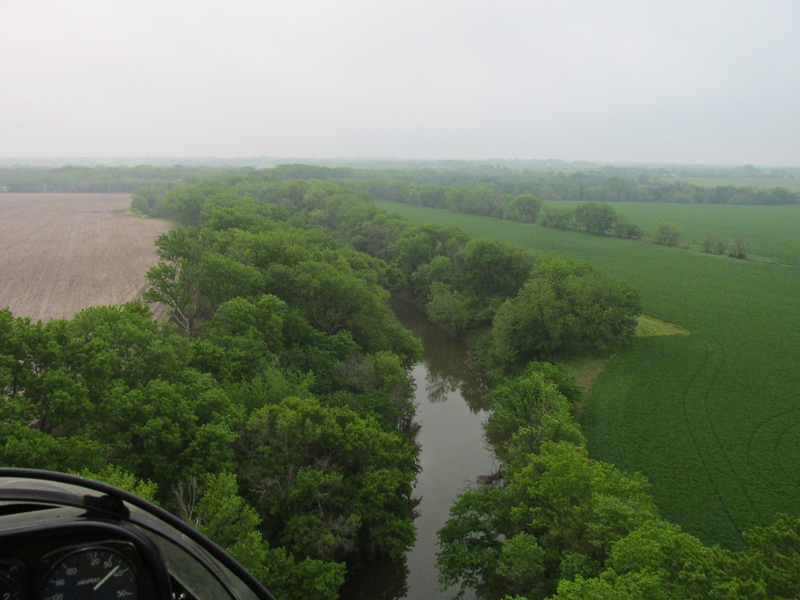 Here is an example of the “depth effect” produced by the atmospheric conditions during the flight. It reminds me of a painting style prevalent in classic Japanese and Chinese art. 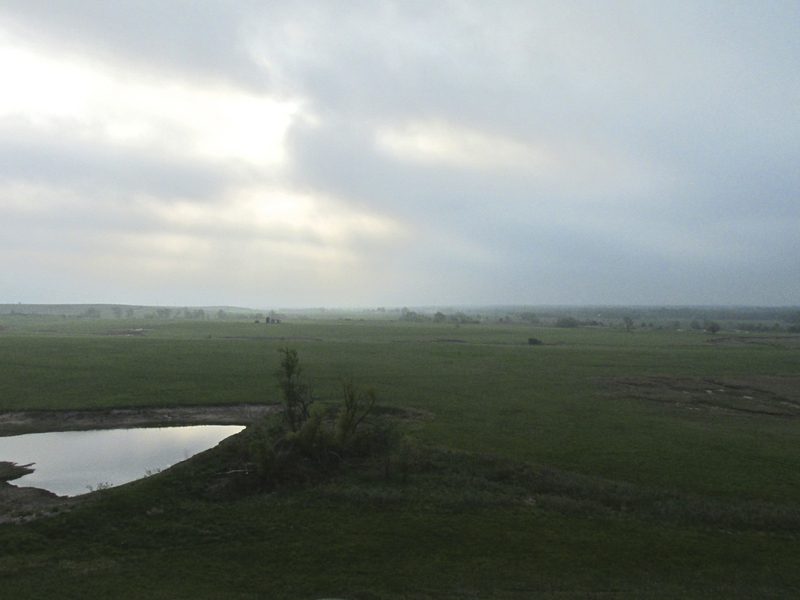 It didn’t quite form a dramatic shaft, but the sun peaked through for a moment to illuminate this farm. 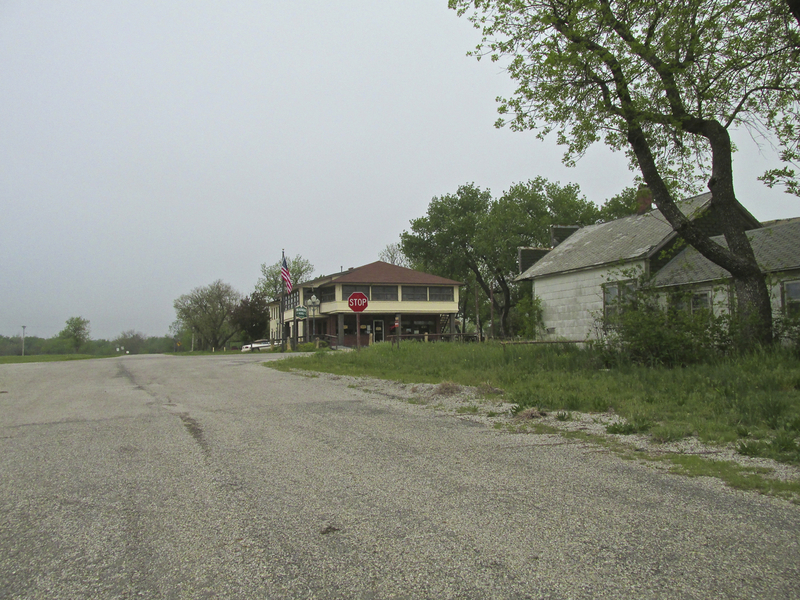 Finally Rose Hill, Kansas appeared. I passed it on the North side. 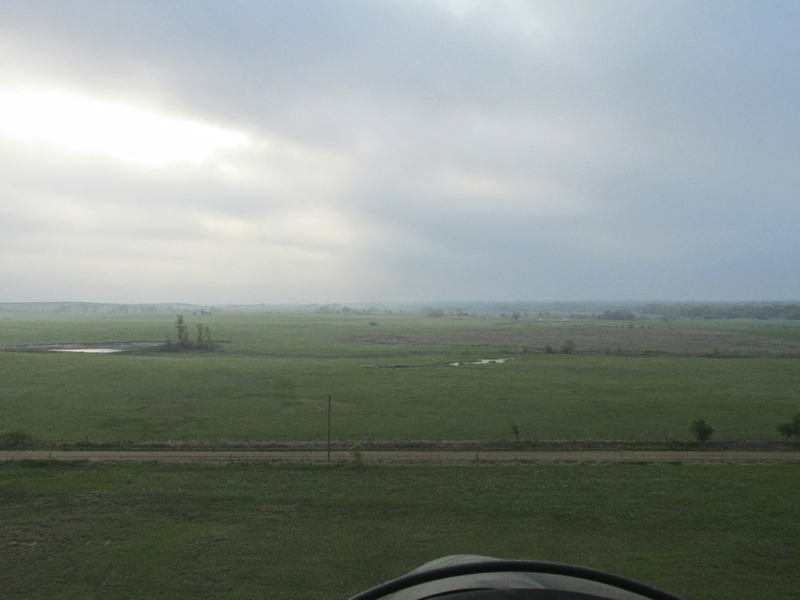 This is looking Southeast from 1,000 feet AGL. I used my telephoto lens to reach over to this area. It is Cook Airfield which is 2 miles West of Rose Hill. 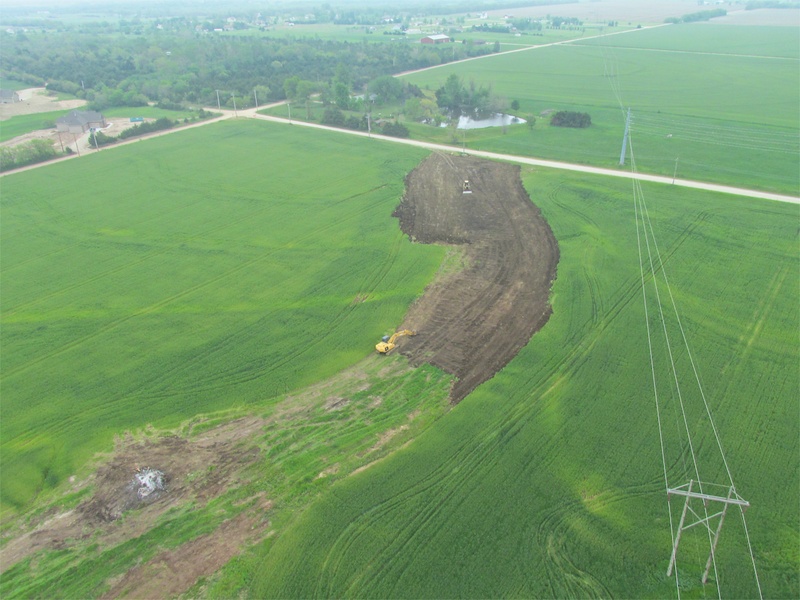 It looks like these guys are leveling a section of this field to make it better for growing. Low spots get soggy and are bad for crop growth, combines and tractors. An hour and a half later, I am again about to cross The Ninnescah River, this time heading West. I call this zone “The Notch”. 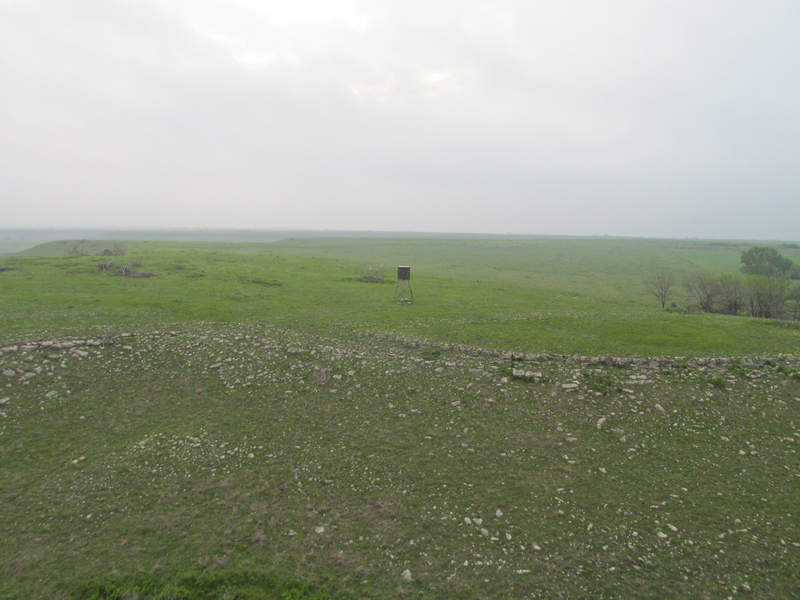 It is a fairly open patch between Derby, Kansas on the North and Mulvane, Kansas on the South. 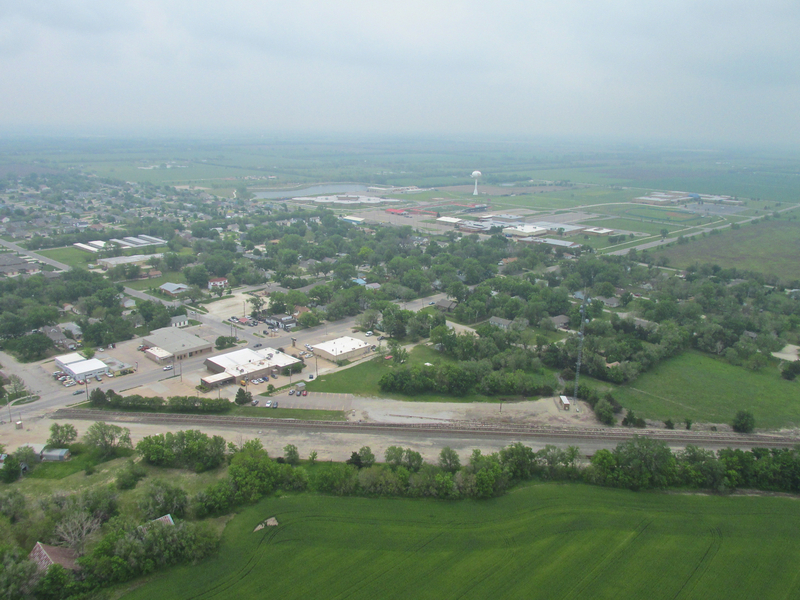 Trains are great to watch from the air. There is much train traffic on this line. Finally destination reached. 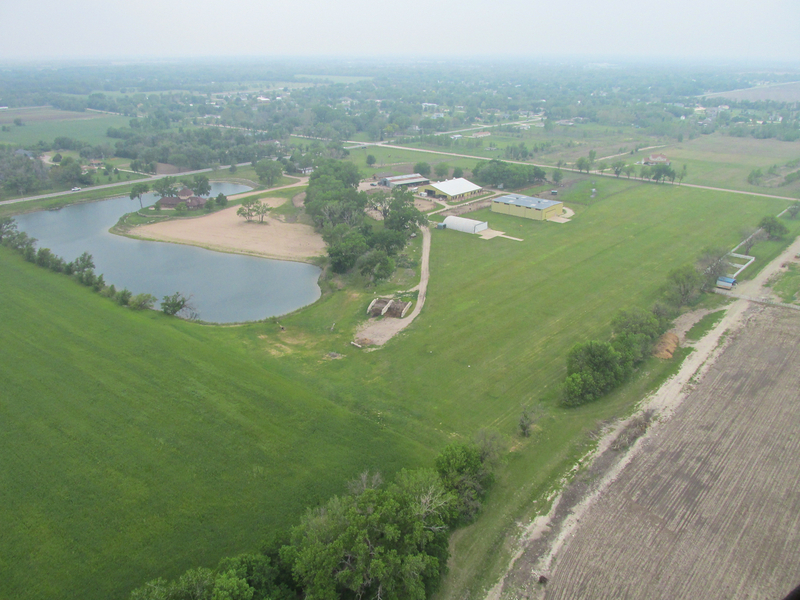 Selby Horse Stables and Aerodrome from 400 feet AGL looking Northeast. 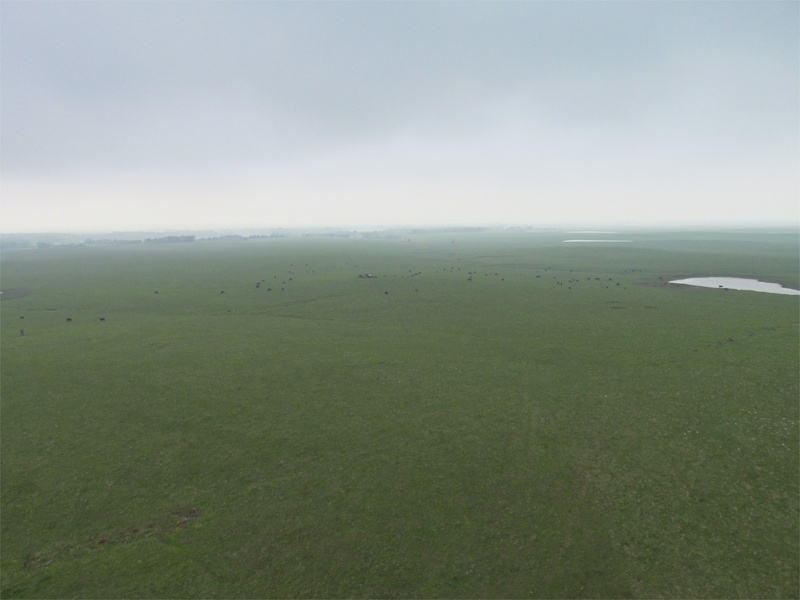 If I never get to fly this course again in the same conditions, I will always have a fond memory of The Flint Hills and Beaumont, Kansas in the Mist. For me a cautious foray yielded great results and I met two like-minded 21st Century Suburbanites out for a Saturday Adventure as well. Great photos! 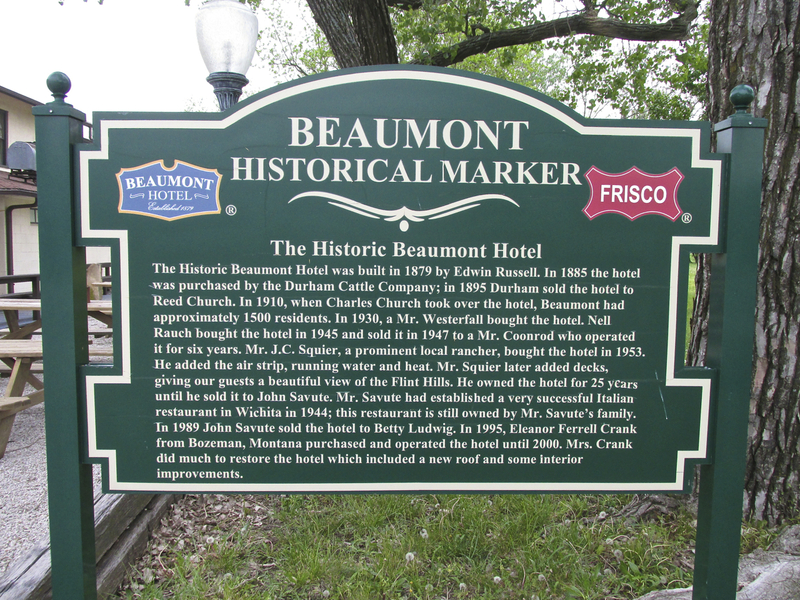 Looks like a great trip to Beaumont. Thanks, Jack! I’m glad you liked it. That was a special day.